LA SGC Overear Stormy Weather - 'Pie' - International Best of Breed 2016, 2015, 2014, 2013, 22nd Best International Allbreed Alter 2017, 9th Best International Allbreed Alter 2016, 9th Best International Allbreed Alter 2015, 22nd Best International Allbreed Alter 2014 and 22nd Best International Longhair Cat 2013. 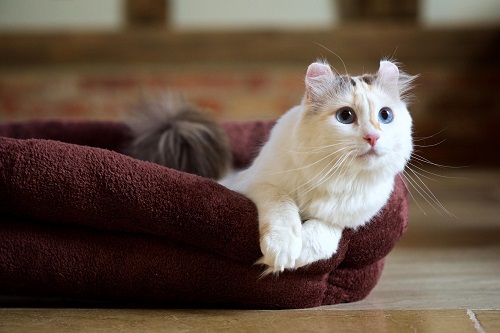 Pie is the first all breed cat in the UK & first American Curl Worldwide to be awarded 5 International Wins! My name is Claire Winman and I started OVEREAR American Curls in 2007. I am the foundation breeder of American Curl cats in the UK. The American Curl is not a man made or designer breed but the wonderful result of a spontaneous mutation giving them their enchanting ears. They are still relatively rare throughout the world and very rare in the UK. I have been breeding pedigree cats since 2002. Overear is a registered prefix with TICA and we aim to have between 1-3 litters per year, although we may not breed every year. Enquiries are welcome as we will have a small number of cats available to pet or show alter homes each year. American Curls are a rare breed and you will be expected to meet certain criteria to home one of our babies. Overear are proud to be the breeders and/or owners of the following successful show cats.